The VMM-2 block is in the Middle Magdalena Basin and is adjacent to VMM-3. The VMM-2 block extends over an area of more than 29,000 hectacres in the Cesar Department and is comprised primarily of the Aguachica municipality, but also extends into the municipalities of Río de Oro and Gamarra. 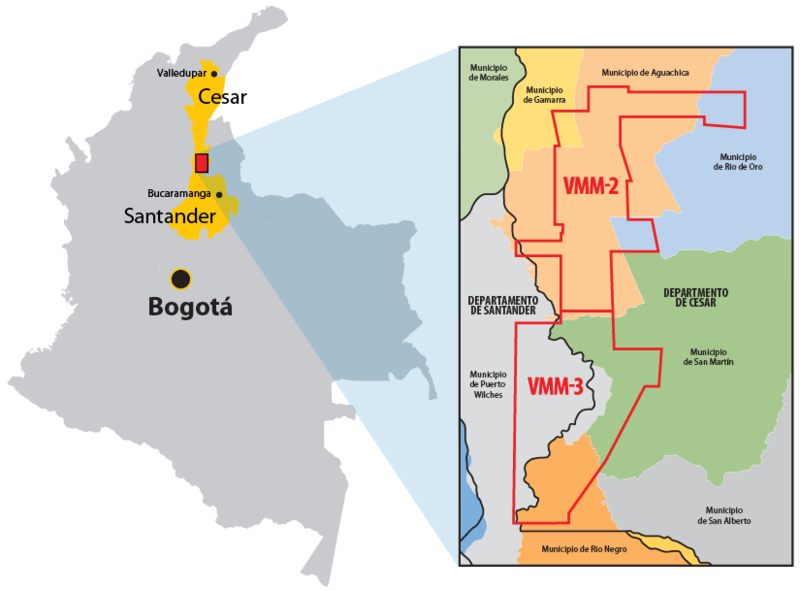 When did ConocoPhillips Colombia become the operator of VMM-2? We signed an Additional Contract and were named as operator of the VMM-2 block by the National Hydrocarbon Agency (ANH) on July 13, 2017. We hold an 80-percent interest in the unconventional reservoirs in the block and Canacol Energy Colombia S.A. is the remaining interest owner. There are nine years of exploratory activities planned for the VMM-2 block. The exploratory period is divided into three distinct phases of three years each. The first phase began on July 14, 2017. How much is the investment for the first phase of the contract? Our investment commitment for the first phase is approximately US$17 million. Does ConocoPhillips Colombia have an environmental license for the exploration of unconventional reservoirs? No, we still do not have an environmental license for the exploration of unconventional deposits. We submitted our application to obtain an environmental license for the exploration of unconventional reservoirs in the VMM-2 block on April 11, 2018, and are awaiting ANLA’s decision. What does ConocoPhillips Colombia have to do to get an environmental license for unconventional activities? To obtain an environmental license for unconventional exploration, we will prepare and submit an EIA to the National Authority of Environmental Licenses (ANLA) for approval (per ANLA’s Unconventional Environmental Regulations). We continue to follow the process to complete the new EIA, which includes performing environmental baseline studies and conducting socialization meetings with communities. These meetings allow for community members to ask questions and express concerns about our potential plans. The feedback we gain from the socialization meetings is taken into consideration as we develop the EIA. When does ConocoPhillips Colombia expect to begin production from VMM-2? As we are in the permitting and pre-exploration process and have not yet determined the characterization and quality of the reservoir, we do not have an estimate for when or if commercial production will occur.